This is a simple weeknight meal that uses a few ingredients and the oven does most of the work for you. I generally have several bottles of various sauces, dressing, etc. in my fridge and need to use them before they go bad. Since, I don’t like to throw away my various food items, I use them before I loose them. This recipe is based on the concept of use it before you lose it. Serve as an appetizer or a main course. Whisk the gyoza dipping sauce and the honey mustard in a medium bowl. Spray the Dutch oven or large pot with non-stick cooking spray. 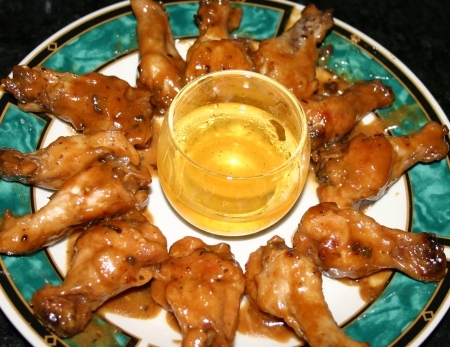 Add drummettes in to Dutch oven and pour sauce over them, mix slightly, cover and place into a preheated oven at 375 degrees for 1 hour or until the sauce sticks easily to the drummettes and the meat easily comes off the bone. Place on a serving dish with honey and serve.